It's pattern flipping time again. I just love this series...have you noticed?? 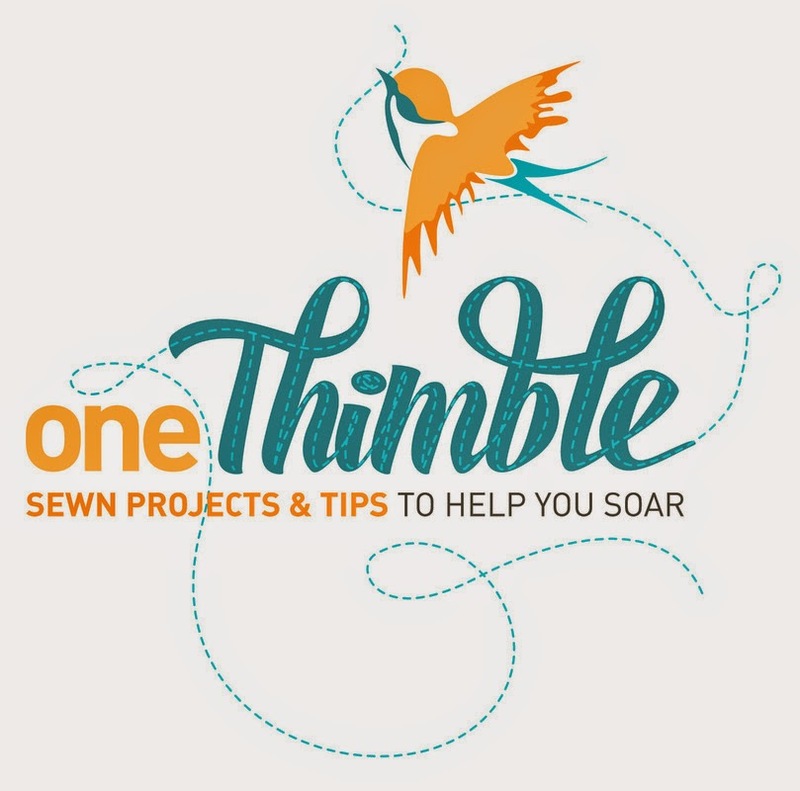 I love the idea of taking an awesome pattern and adding some personal pizzazz and then every day seeing how someone else flipped it their way and came up with something completely different. 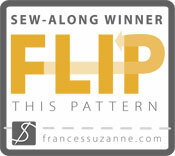 Frances Suzanne have impeccable taste when it comes to choosing the feature pattern each month. I'll be totally honest. I wasn't sure about this one initially. It looked so wintery and here in Queensland we go from winter to summer without pausing for spring in between. 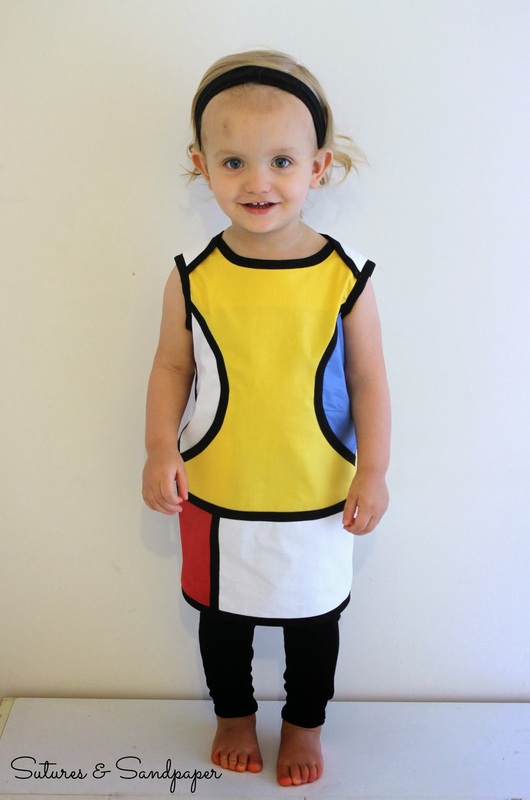 So it is pretty warm and less is more for toddler clothing already. 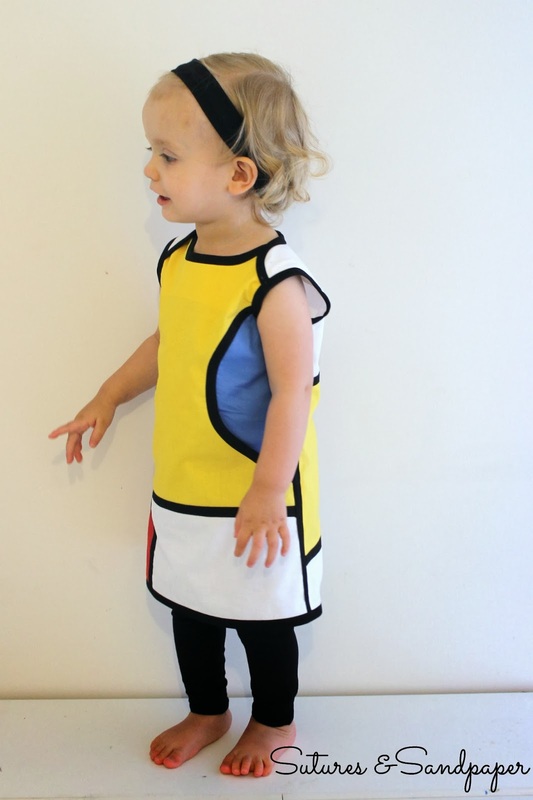 But, like a true pattern addict, I jumped at the chance for a pattern with a discount code and purchased the Sunki dress and leggings. 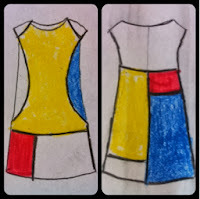 As with the other months of Flip This Pattern I started with the sketch of the dress as is. This pattern has a unique design. 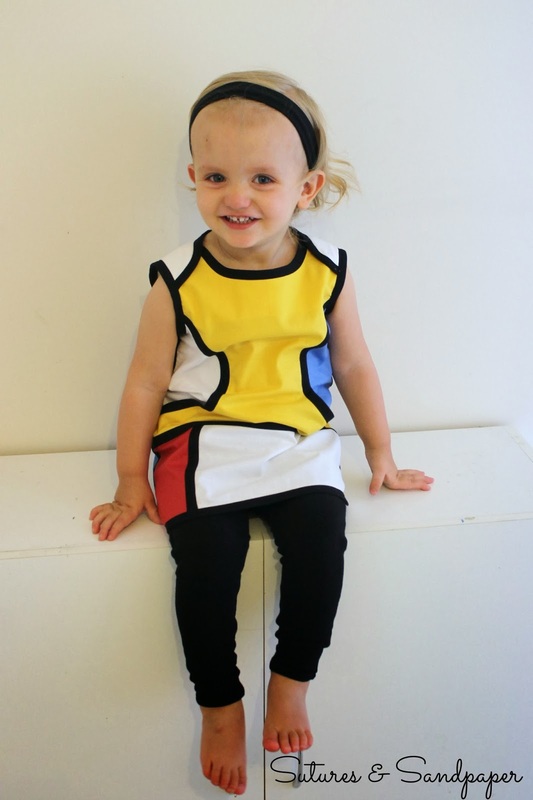 It is loosely based on an A-line dress but with cool features like curved contrasting pockets and overlapping neck line. My first thought was I'll just make it as intended to get a feel for the design but I'll omit the sleeves. 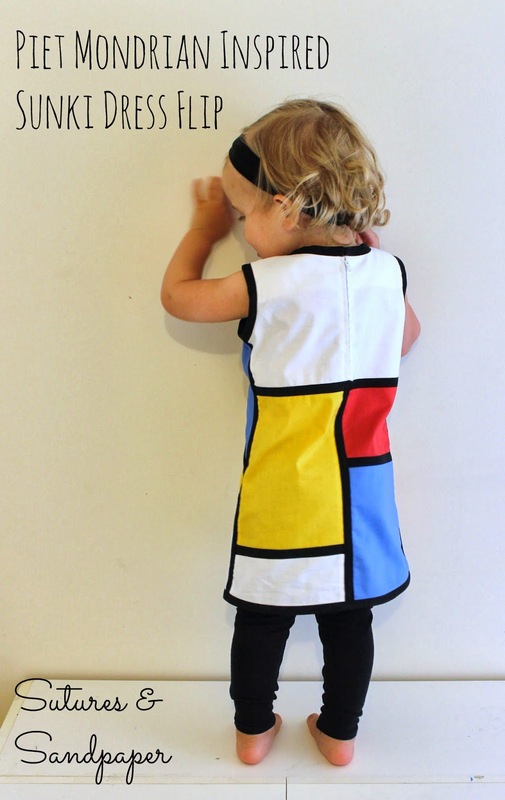 But, when I looked at the lines of the dress, it reminded me of the artworks of Piet Mondrian. His bold primaries with white all separated up with black lines. So I sketched in some lines, grabbed some of the boys pens and started to colour. (I could only find a red felt pen, yellow crayon and blue pencil... we have since been shopping for refreshed art supplies for the kids). 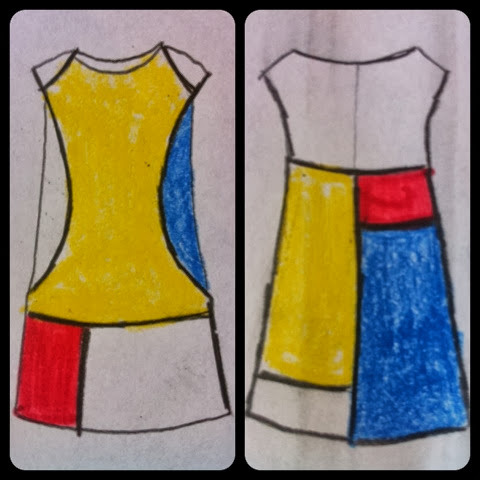 So the outline of the dress is identical to the original, minus sleeves, but I changed up some of the construction to fit with my design ideas. 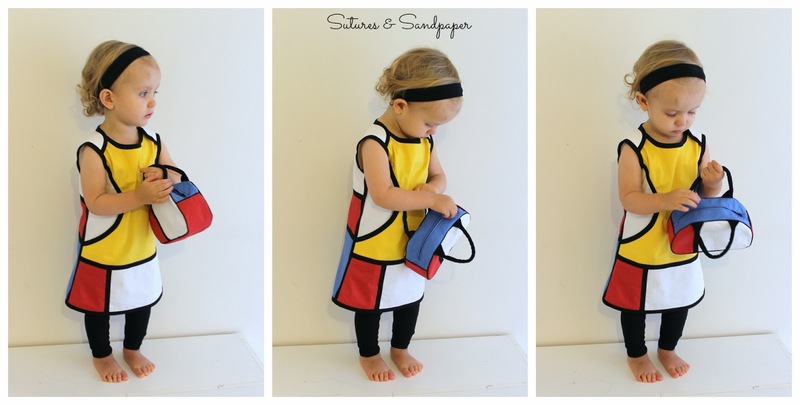 I made the main pieces from a patchwork of different colours to fit my design. I used 2" wide strips to make the bias binding for the pockets, neck, armholes and hem. I used 1" wide strips to cover the seams and divide the colours. So all the black parts ended up 1/2" wide :) (I love my bias binding maker). 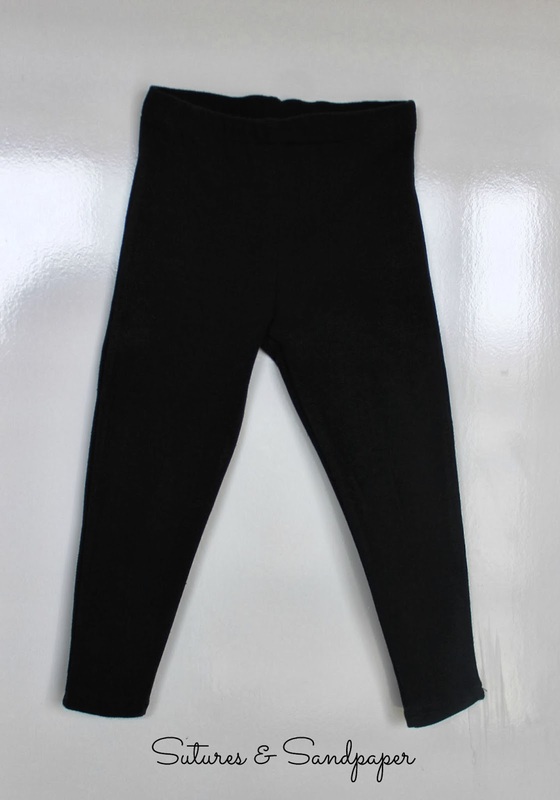 I also made up a pair of the Sunki Leggings, I didn't flip them, just made them 'as is' to complement the dress. Some of the details: The fold over shoulder pieces, the shortened zip and the inside view of the seams. Eloise just loves bags at the moment so I made up a miniature version of the Paco Bean Dottie Bag to match the dress. I'm so pleased with how this dress turned out and the fit is pretty good too. Eloise was pretty happy with it too. I made up a simple headband from the same fabric as the leggings. It helped keep that wild hair under control. I think I like the back of the dress the best? Though the curved pockets at the front are pretty darn cute. Thanks for popping by. 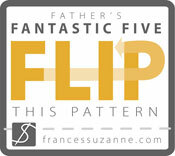 Be sure to visit Frances Suzanne to see all the other flips for this month. You are soooooooooooo clever!! I just love everything about it. Especially the thought you put into the construction. Thanks Renee :) A huge compliment coming from someone with your talents! This is so cute! Great job, Kerry! Simply FANTASTIC! Love the bright, bold colors and crisp lines...but still able to 'see' Sunki components in your creation! THis is sooo clever! What an awesome job flipping the pattern!!! this is beautiful! I love the colors and that bag is tooo cute. GREAT Job!!! I love color-blocking and your take on it is so fun! What a great flip! 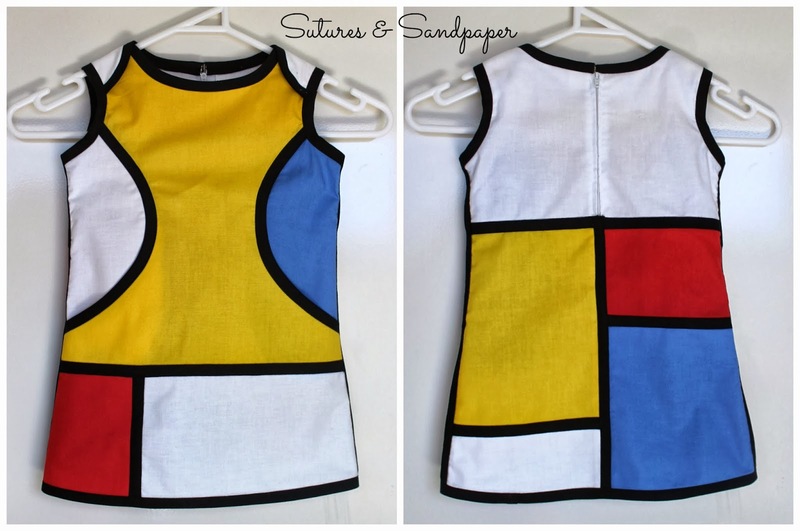 I love the color blocking and using the bias binding to hid seams. Great idea! 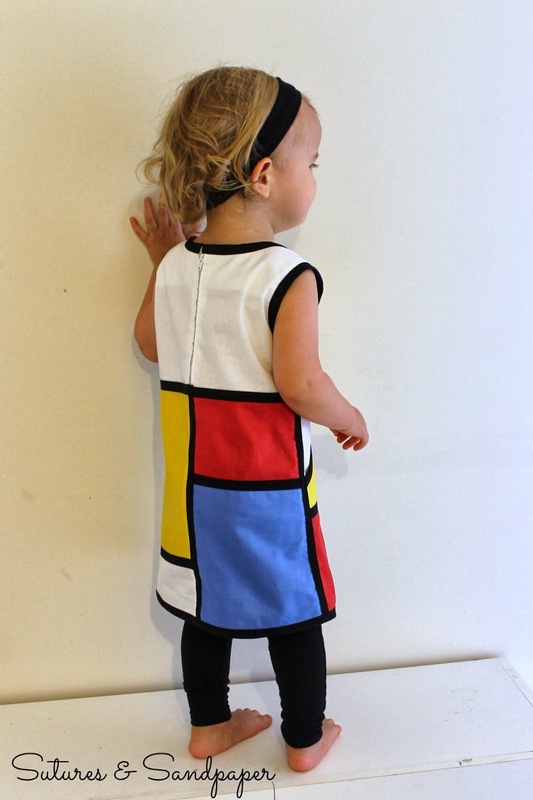 Love love love the Mondrian inspiration! Color placement is great! 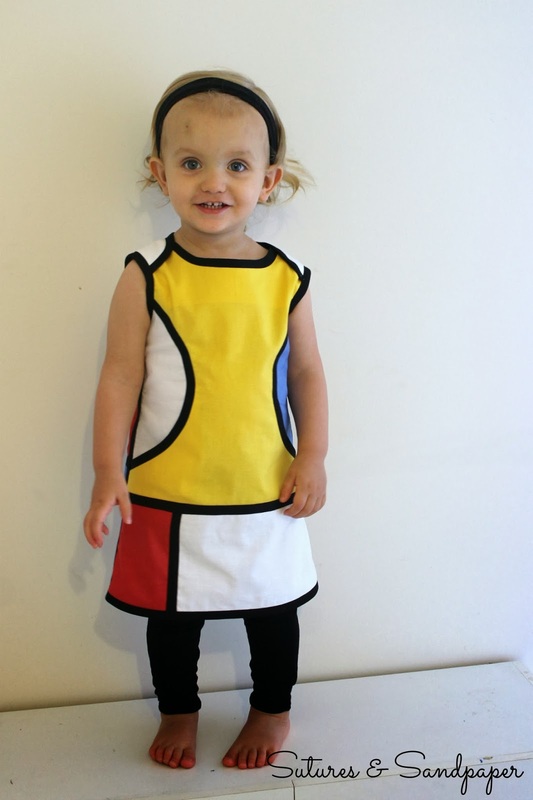 Looks adorable on her! Oh my gosh I love yours! I will be copying for sure! Fabulous! I have to make one of these this summer. Timeless design. Thanks for stopping by :) I love your pattern, it's quite unique!